Advances in robotic vehicles continues to push technological limits and open new markets. 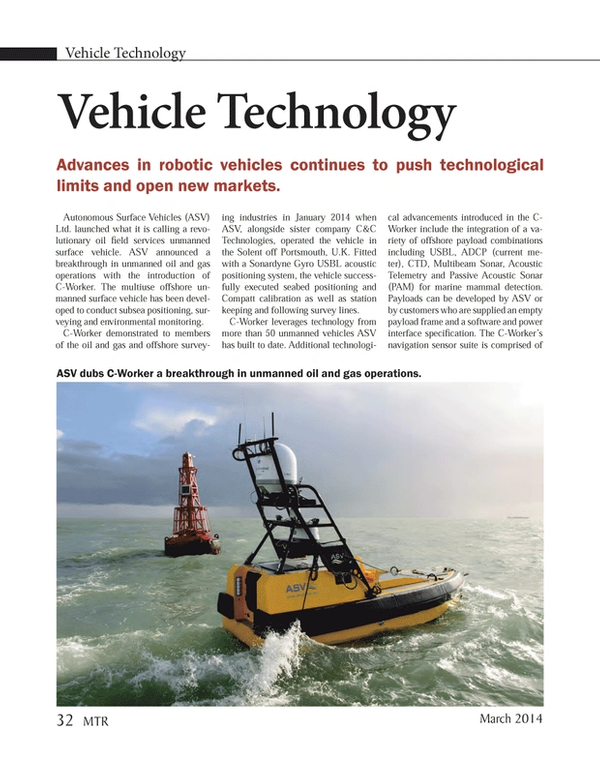 Autonomous Surface Vehicles (ASV) Ltd. launched what it is calling a revolutionary oil field services unmanned surface vehicle. ASV announced a breakthrough in unmanned oil and gas operations with the introduction of C-Worker. The multiuse offshore unmanned surface vehicle has been developed to conduct subsea positioning, surveying and environmental monitoring. C-Worker demonstrated to members of the oil and gas and offshore surveying industries in January 2014 when ASV, alongside sister company C&C Technologies, operated the vehicle in the Solent off Portsmouth, U.K. Fitted with a Sonardyne Gyro USBL acoustic positioning system, the vehicle successfully executed seabed positioning and Compatt calibration as well as station keeping and following survey lines. C-Worker leverages technology from more than 50 unmanned vehicles ASV has built to date. Additional technological advancements introduced in the C-Worker include the integration of a variety of offshore payload combinations including USBL, ADCP (current meter), CTD, Multibeam Sonar, Acoustic Telemetry and Passive Acoustic Sonar (PAM) for marine mammal detection. Payloads can be developed by ASV or by customers who are supplied an empty payload frame and a software and power interface specification. The C-Worker’s navigation sensor suite is comprised of C-Nav DGNSS, color and light cameras, an infra-red pan tilt camera, an x-band marine radar and AIS. He said they will install the system on a newbuild DP2 vessel, Resolution, on long-term charter from Miclyn Express Offshore. The acquisition is in line with Seascape’s continued growth in the Southeast Asia Region where their main operations are in Indonesia, with other areas including Thailand and Timor Leste Australia. The 1,000-m-rated Tiger has a proven pedigree in the oil and gas industry, where operators value its maneuverability inside structures and its ability to cope with strong currents. Despite its compact size, a range of sonars, cameras and tools can be added as needed to undertake a wide scope of tasks. Supplying the Tiger was Singapore-based Saab Seaeye distributor, Oceanvision. Teledyne Gavia completed a contract with the Armament Department of the Polish Ministry of Defense for the delivery of two Gavia Defense AUV systems for mine countermeasures (MCM). The provision includes all required topside equipment and AUV operation and maintenance training. Teledyne Gavia completed a competitive tender process for delivery of the first MCM AUVs into Poland, winning the contract on the basis of best value with conformance to the required functional and technical parameters. The Gavia vehicles delivered are equipped with the EdgeTech 2205 side scan sonars. The simultaneous dual frequency 600/1,600 kHz EdgeTech 2205 side scan sonar and the Kearfott T24 inertial navigation system (INS) allow the Gavia to gather high resolution, accurately navigated, sonar images while remaining submerged for several hours of continuous operation at survey speeds up to five knots. The addition of a high accuracy GPS and the augmentation of the INS by Long Base Line (LBL) beacons ensures precise navigation during even longer duration and deeper missions. This combination of sensors make it ideal for mine countermeasures (MCM) and search and salvage operations, in continental-shelf waters and beyond. The Polish Armed Forces also purchased SeeTrack Military software from SeeByte Ltd. The SeeTrack Military MCM Evaluator software package includes all core MCM options: PMA Automatic Target Recognition; Seafloor Classification; Change Detection; and SeeByte’s Performance Analysis and Training Tool. The software provides a solution for rapid on-site analysis and fusion of sensor data for the fleet of Gavia AUVs, rapidly generating targeted information from the AUV data. The sea acceptance trials took place at the Teledyne Gavia proving grounds near Kopavogur, off the west coast of Iceland. The tests were supervised by representatives of the Polish Navy, and the results were checked by specialists from four District Military Division (Gdansk). Data analysis during the SATs and training confirmed the vehicle performance and suitability for MCM search, location and identification missions. The vehicles were supplied through Enamor Ltd. (Gdynia, Poland), Teledyne Gavia’s official representative in Poland. Enamor is a research and production company focused on new technology and active in many projects in Poland in the fields of navigation, communication, hydrography and automation. The Gavia Defense AUV has a low-logistics, fully modular design. This facilitates rapid transport and maintenance, and is designed to increase operational availability and reliability. Each Gavia can also be equipped with a variety of additional sensor modules. This creates an asset which can be configured for MCM, search and salvage or hydrography missions, without needing to be dedicated to just one task. In the future, the AUVs delivered in Poland can be equipped with modules for multi-beam bathymetry, sub-bottom profiling or even submarine emulator sonar training targets. This contract marks the first purchase of AUVs for MCM by the Armed Forces of Poland. The knowledge gained from operating the Gavia AUVs will help develop the concept of use of AUVs in the Polish maritime theatre. Significant benefits are expected from a low-logistics AUV asset that can carry out both MCM and hydrography missions. ROVOP has expanded its fleet of remotely operated vehicles (ROVs) by taking delivery of four new hydraulic work class systems with a further four new ROVs expected later in the year. The company has invested $20 million in the four hydraulic Schilling HD work class ROVs, which were delivered during January, and is working to grow its offshore team by 50 to 110. ROVOP has also invested in its own ROV simulator for its in-house Academy in order to further develop the training and competence of its offshore staff. Addressing the talent shortage in the subsea industry, the Academy seeks to build skill and competence in offshore personnel whatever their current career level. The $350,000 simulator enables ROV pilots to hone their skills onshore, in physics-accurate conditions. Headquartered in Westhill, Aberdeenshire, ROVOP is an independent company which is 100% focused on providing ROVs and services to the oil and gas and offshore wind industries. The company’s latest ROVs have been manufactured by FMC Schilling Robotics and were put through their paces during acceptance testing by the ROVOP team. The ROVs are equipped with the latest Hammerhead control system, which gives pilots the ability to use an increased suite of auto functions, including automated manipulator control. The systems are designed around the 60-minute repair philosophy, which is unique to Schilling work class ROVs, and fitted with the latest Teledyne CDL TOGS-NAV (Tiny Optical Gyro System for navigation) technology unit which combines DVL, Fiber Optic Gyro and depth sensors in one compact package to provide maximum ROV control for safe and efficient working. Steven Gray, ROVOP’s managing director, said, “ROVOP enjoyed strong business growth in 2013 and this is set to continue in 2014. In order to deliver the best in class service, we are continuing to invest in the latest and most advanced equipment on the market, staffed by the best people, to ensure we are at the forefront of technology, reliability and competence.